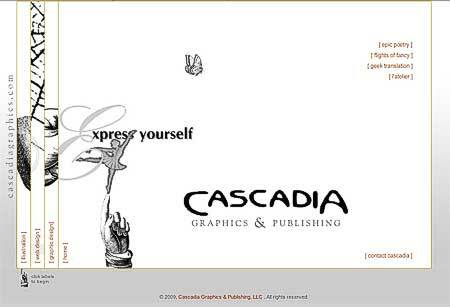 It’s been years since I’ve updated cascadiagraphics.com and it was frightening to see that I had not even updated the copyright notice since 2001, so I carved out a little time to do some work for myself. It’s sobering to go over the vast body of one’s work and choose the few that are portfolio material. In fact, I realized that most of it represents the design sensibilities of my clients as much as or more than my own. I tried to choose the pieces for which I placed a heavy hand on the aesthetic scale. The site itself is the one thing that comes close to demonstrating my capabilities. It ended up being mostly Flash-based, built on a CSS template and that gave the left side of my brain a bit of a workout. Moving away from the portfolio portion of the website, I am actually more pleased with the consulting/training area (“geek translation“). CGCC students who are most likely to visit the site will appreciate that I finally removed the “2002 Class Schedule”. I also used the summer break to update course handouts and exercises. They are pretty elementary but may be of interest to someone in search of really easy Photoshop, Dreamweaver, or Flash tutorials. My résumé is also more-or-less up to date but the basic idea hasn’t changed for 12 years. It matches an 8-page printed piece. I’m not job-searching so I’m not even sure why I keep it up, except to impress potential clients that I am skilled as a water witch (among other things). A few loose ends remain, such as the tie to projects under construction. Some clients are not anxious to reveal work in progress but there are some recently completed projects that would work to at least ensure that my portfolio doesn’t go stale. A final loose end is the SEO work. Since most of my business is referral I am sure not aiming to be in the top 1,000 search results for “graphic designer” but it is useful to get the old site out of the Google cache and replace it with something with a more current copyright date.